Created by Derval O'Rourke, Tomato passata is super handy to have in the kitchen. It’s an easy base as a pasta sauce if you’re in a hurry! Use a fork to mash the avocado, mint and lime juice in a small bowl and set aside. Heat the olive oil in a large pan over a medium heat. Add the onion and cook for about 5 minutes, until softened. Add the chicken, spice mix and garlic and cook for 3–5 minutes, then set aside. Divide the avocado mixture between the two tortillas, spreading it into an even layer. Add a layer of passata, followed by a layer of the spicy chicken mixture. Neatly roll each tortilla, then place them side by side in an ovenproof dish. Sprinkle the cheddar over and place in the oven. 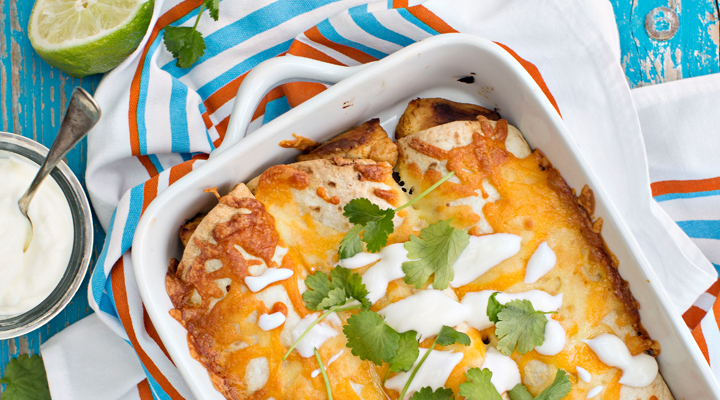 Divide the enchiladas between warmed serving plates and top each one with a dollop of natural yogurt.